, the author of some dramas and poems of considerable merit, was a native of Ireland, where he was born in 1736. He appears to have profited by a liberal education, but entered early into the army, and attained the rank of captain in the 73d regiment of foot on the Irish establishment. When that regiment was reduced in 1763, he was put on the half- pay list. In 1763 he became acquainted with the late William Gerard Hamilton, esq. 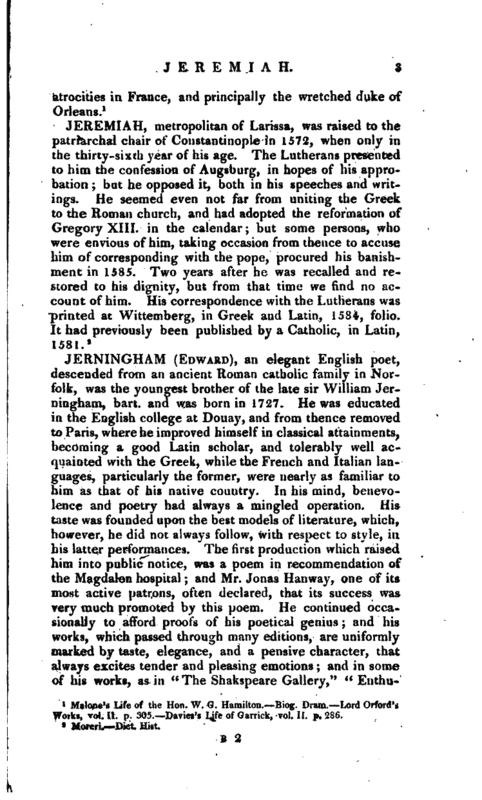 who was charmed with his liveliness of fancy and uncommon talents, and for about five years they lived together in the greatest and most unreserved intimacy; Mr. Jephson usually spending the summer with Mr. Hamilton at his house at Hampton-court, and also giving him much of his company in town during the winter. In 1767, Mr. Jephson married one of the daughters of Sir Edward Barry, hart, a celebrated physician, and author of various medical works; and was obliged to bid a long farewell to his friends in London, Dr. Johnson, Mr. Burke, Mr. Charles Townsend, Garrick, Goldsmith, &c. in consequence of having accepted the office of master of the horse to lord viscount Townsend, then appointed lord lieutenant of Ireland. 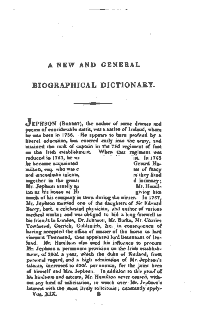 Mr. Hamilton also used his influence to procure Mr. Jephson a permanent provision on the Irish establishment, of 300l. a year, which the duke' of Rutland, from personal regard, and a high admiration of Mr. Jephson’s talents, increased to 600l. 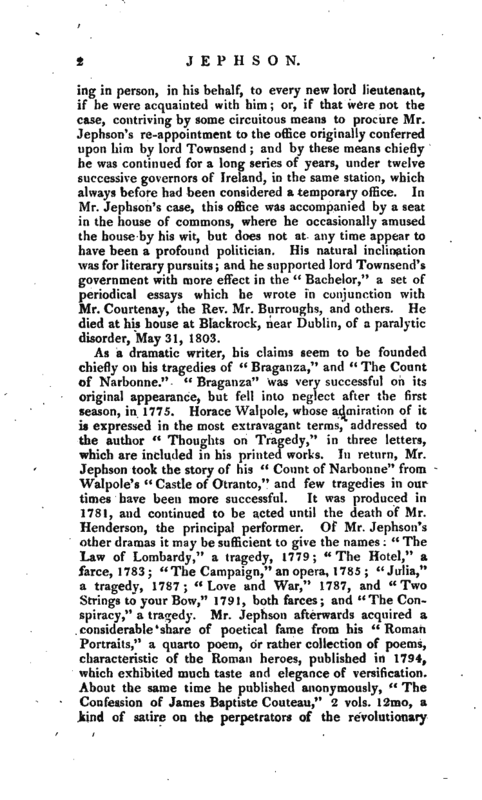 per annum, for the joint lives of himself and Mrs. Jephson. In addition to this proof of his kindness and esteem, Mr. Hamilton never ceased, without any kind of solicitation, to watch over Mr. Jephson’s interest with the most lively solicitude constantly | applying in person, in his behalf, to every new lord lieutenant, if he were acquainted with him; or, if that we.e not the case, contriving by some circuitous means to pro Mire Mr. Jephson’s re-appointment to the office originally con i erred upon him by lord Townsend and by these means chiefly he was continued for a long series of years, under tw- ive successive governors of Ireland, in the same station, which always before had been considered a temporary office. In Mr. Jephson’s case, this office was accompanied by a seat in the house of commons, where he occasionally amused the house by his wit, but does not at any time appear to have been a profound politician. His natural inclination was for literary pursuits; and he supported lord Towosend’s government with more effect in the “Bachelor,” a set of periodical essays which he wrote in conjunction with Mr. Courtenay, the Rev. Mr. Burroughs, and others. He died at his house at Blackrock, near Dublin, of a paralytic disorder, May 31, 1803. Malotie’s Life of the Hon. W. G. Hamilton. Biog. Dram. Lord Orford’s Works, vol. 11. p. 305. Davies’s Life of Garrick, vol. II. p. 286.